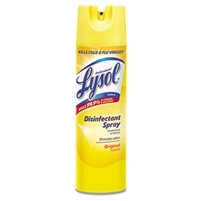 Victoria Spray Disinfecting Spray Model C00077 - Lemon Scent - 12 x 20oz Cans 15.5oz net weight per can. Excellent disinfectant Spray for use in hospitals, health care settings, child care centers, day care centers, clinics, etc. A phenolic disinfectant and deodorant spray that contains an odor counteractant that chemically neutralizes malodors. Kills most germs,including HIV-1(AIDS Virus), herpes virus I and II, and tubercule bacilli (TB). Is fungicidal(controls mold and mildew),bactericidal, staphylocidal, tuberculocidal, virucidal, and pseudomonicidal to help stop the spread of diseases. Has a crisp, refreshing Lemon fragrance that tells you it’s working. Hospital Disinfectant / Deodorant / Air Sanitizer spray is highly effective against most Germs. Disinfect Surfaces Fast and Eliminate Odor-Causing Bacteria. > HARD SURFACE: EPA-registered to Disinfect Hard Surfaces with 24 Kill Claims. Clorox® 4 in One Disinfectant & Sanitizer is EPA-registered to kill 24 key germs of concern, including the viruses that can cause cold and flu, key bacteria associated with food poisoning — E. coli and salmonella, as well as MRSA, HIV, herpes and athlete’s foot fungus. > SOFT SURFACES: Sanitizes soft surfaces in just 30 seconds. Illness-causing bacteria live on soft surfaces too! Don’t be fooled by products that simply freshen fabrics – Clorox® 4 in One Disinfectant & Sanitizer is EPA-registered to kill bacteria and sanitize soft surfaces in just 30 seconds. Clorox® 4 in One Disinfectant & Sanitizer can help prevent the spread of illness-causing bacteria on mattresses, curtains, cushions, rugs, mats and more. > AIR SANITIZATION: Sanitizes the air and kills odor-causing airborne bacteria. Clorox® 4 in One Disinfectant & Sanitizer is EPA-registered to kill odor-causing bacteria in the air. If your current aerosol is just masking odors, you’re not getting at the root of the odor problem. Clorox® 4 in One Disinfectant & Sanitizer eliminates odors at their source and leaves a pleasant citrus scent. > REDUCES ALLERGENS*: Which trigger allergies and asthma. Clorox® 4 in One Disinfectant & Sanitizer is proven effective at reducing key common allergens*. While allergens cause all-too-common allergies, they are also one of the key triggers for asthma — a serious health and economic concern according to the CDC. > Unlike many aerosols, Clorox® 4 in One Disinfectant & Sanitizer NO PRE-CLEANING REQUIRED for either disinfection or sanitization. With no additional step in your cleaning routine coupled with so many uses in one product, you can accomplish so much more in your cleaning routine with less. > Excellent for use in health care settings such as child care centers, daycare centers, restaurants, cafeteria's, hospitals, nursing homes, schools and institutions, pre-k, k-12. 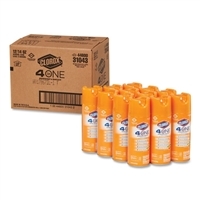 Includes 12 aerosol cans of 4 in 1 Sanitize Disinfectant. *Cockroach matter, dust mite matter, dog and cat dander. Hospital disinfectant/deodorant spray is highly effective against most Germs. Disinfect Surfaces Fast and Eliminate Odor-Causing Bacteria. EPA-registered to kill 64 microorganisms, more than the other leading disinfecting spray*. With faster kill times — 3x faster than the other leading disinfecting spray on most bacteria*. Incredibly versatile — can be used on a wide variety of surfaces, Registered to Kill Multiple strains of MSRA, including CA, and HA MSRA. Registered to Kill 3 Strands of E. Coli (a leading cause of Food Borne Illnesses). Registered to Kill Both Viruses that are the Leading causes of the Common Cold. Registered to Kill the Hepatitis C Virus. Excellent for use in health care settings such as child care centers, daycare centers, restaurants, cafeteria's, hospitals, nursing homes, schools and institutions, pre-k, k-12. Includes 12 aerosol cans of disinfectant. Hospital disinfectant/deodorant is highly effective against TB, MRSA, influenza A (H1N1), norovirus, hepatitis A, poliovirus type 1 and HIV-1 (AIDS virus). Virucidal, fungicidal, bactericidal. Prevents odors and growth of mold and mildew.